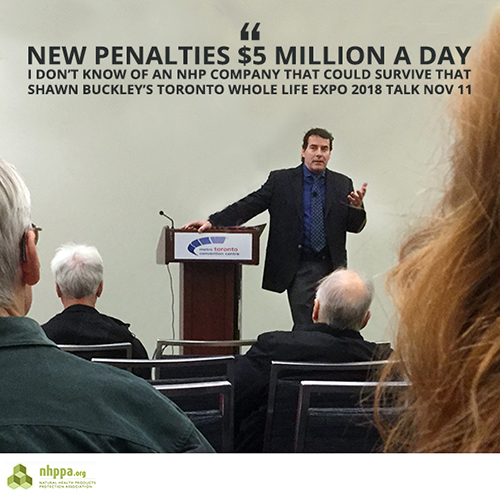 New video recording from Shawn Buckley’s Whole Life Expo talk (105 minute watch), in Toronto, as part of our ongoing work to educate public and industry. “If you’re going to be facing $5 million fines, not just for the company, but also every director and officer involved in that decision, who can withstand that?” Most natural health industry stakeholders do not realize that steep penalties currently in place for chemical pharmaceutical companies, $5 million per day, will also be applied to natural health product companies as part of the harmonization. In this lecture you will learn about several changes proposed by Health Canada. Namely, forcing natural products to be regulated as chemical drugs. These changes will increasingly threaten everyone’s access to natural remedies of their choice and funnel the public into a more dangerous model, one of pharmaceuticals.